Welcome to the wonderful world of cannas! Regretfully, cannas are not widely used by homeowners, although the interest and demand for these beautiful plants seems to be increasing. There are few easier to grow garden plants that will also add that tropical touch to the garden and ask for so little in return. Cannas are valued mostly for their large tropical foliage and showy, brilliantly coloured flowers. The foliage is as ornamental as the flowers. It may be pure green, greenish blue, coppery to purplish, ruby, or green with white stripes. 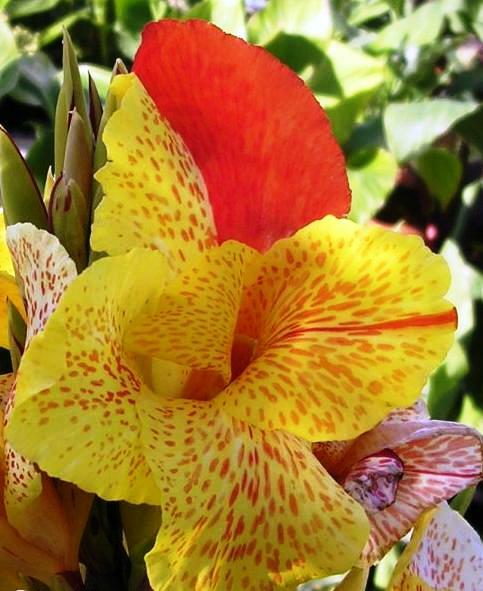 Cannas, or canna lilies, are easily grown tender perennials native to tropical and subtropical areas. The most popular kinds of cannas have beautiful gladiolus-like flowers perched high above the large, paddle-like leaves. The flowers are typically red, pink, orange, yellow or any combination of those colours. 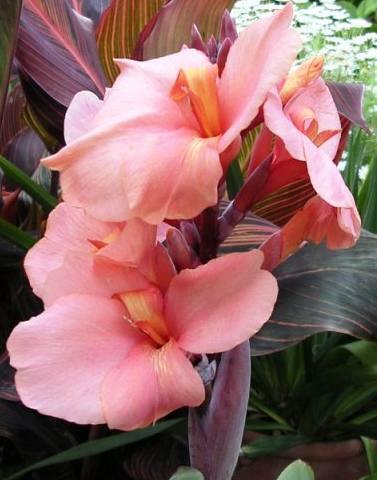 Cannas come in many different sizes � from dwarf plants of about 40cm tall to giants of up to 2-3 metres. The low growing varieties (90-140cm) are perfectly suited for small gardens, apartments, terraces, roof gardens or any other area with limited space. Cannas look fantastic in masses and also grow well in pots. A large flower pot full of cannas really brightens up a sunny patio or porch. With the diversity in size and colour cannas are great everywhere. With their fast growth they will quickly transform any garden into a tropical paradise. Cannas love and need the sun, but in our hot summers they will do fine also in partial shade. Cannas thrive under high summer temperatures. While many plants wither away in the summer sun, cannas really kick in to show you just how magnificent they can be. The only limiting factor in their growth at this time usually is lack of adequate moisture and fertilizer. Soil requirements are rather simple. Cannas grow best in a rich soil with lots of natural matter. 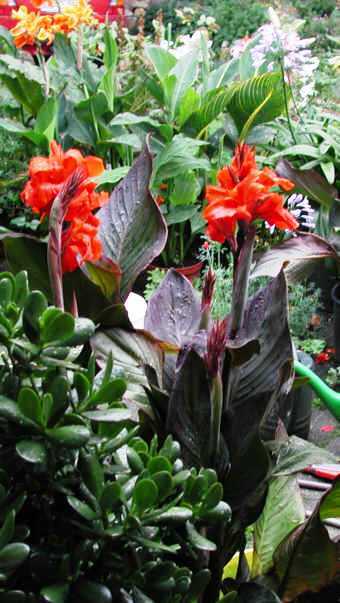 Cannas will also grow in poor soil, but the leaf size and color will suffer. In the end, the flowers might be smaller or the color may be dull. 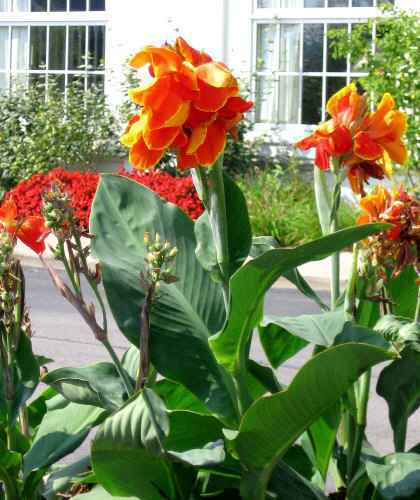 Cannas can take small periods of dry soil, but they cannot take drought situations. If it does not rain, water them generously 2-3 times a week. Cannas prefer a moist soil and even in standing water many cannas will thrive. Thus cannas are also great as border plants for ponds. To assure continuous bloom throughout the summer, remove the dead flower heads so seeds do not form. Usually a second flowering shoot, growing from the node just below the dead flower, will be halfway in bloom already. Remove this shoot also when its blooms are withered. Another flowering shoot will soon develop on the node below. If the dead flowers are not removed, the plant will concentrate its energy on developing seed pods instead of new flowers. When the cannas are done flowering and start to whither, leave the foliage for about six weeks for the rhizomes to gather nutrients) before cutting them down and removing any dead stems. Leave the rhizomes in the ground and add a layer of compost to the top of the soil. This compost dressing will keep the soil rich and ready for the next round of growth and stunning flowers. 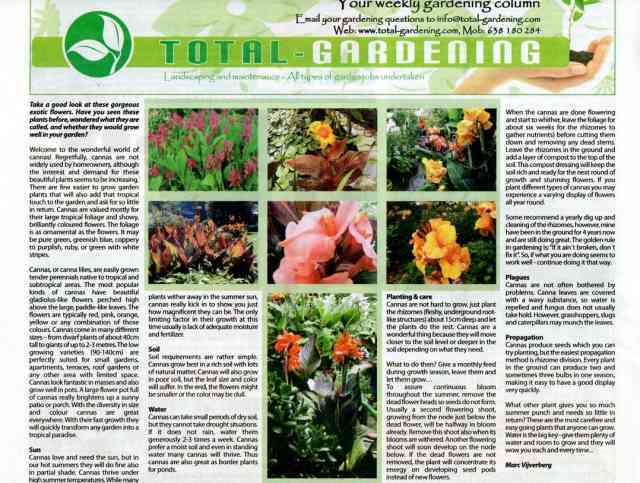 If you plant different types of cannas you may experience a varying display of flowers all year round. Some recommend a yearly dig up and cleaning of the rhizomes, however, mine have been in the ground for 4 years now and are still doing great. The golden rule in gardening is: �If it ain�t broken, don�t fix it�. So, if what you are doing seems to work well - continue doing it that way. Cannas are not often bothered by problems. Canna leaves are covered with a waxy substance, so water is repelled and fungus does not usually take hold. However, grasshoppers, slugs and caterpillars may munch the leaves. Cannas produce seeds which you can try planting, but the easiest propagation method is rhizome division. Every plant in the ground can produce two and sometimes three bulbs in one season, making it easy to have a good display very quickly.